Where is Peter Rabbit? 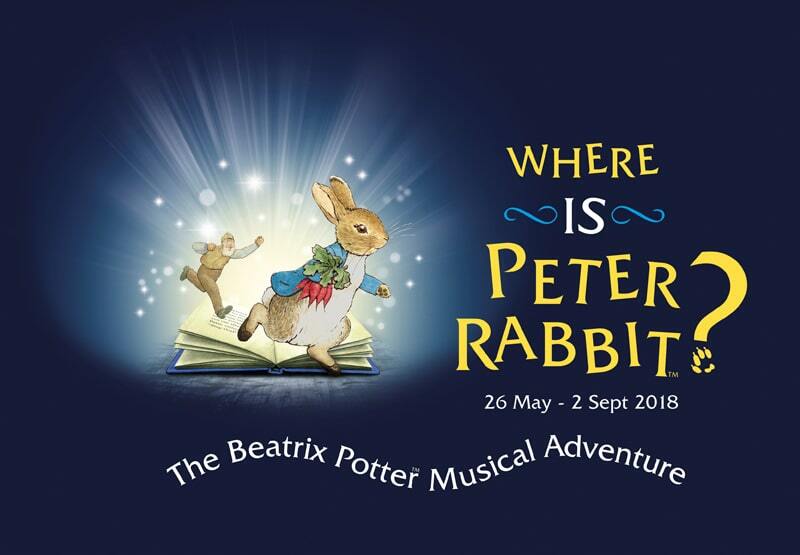 – the Beatrix Potter musical and smash hit sell-out show of last summer is back! This unique theatre production at The world of Beatrix Potter™ brings to life five of Beatrix Potter’s famous stories in a visual spectacular. Music by Steve Edis and lyrics by Alan Ayckbourn. Tickets start from £8 for children and £10.50 for adults, but extra special packages including a private party or afternoon tea with Peter Rabbit are available. After the Peter Rabbit live show, visit the main exhibition in which the sights and sounds of Beatrix Potter’s much loved characters are magically brought to life. The exhibition begins with a 5 minute film introducing you to the author and her stories and illustrations. Step out from the film in to Jemima’s woodland glade and through the trees to see Mr Tod in Tommy Brock’s house and the pigs from The Tale of Pigling Bland. The exhibition features 3D scenes from Beatrix Potter’s stories, atmospheric lighting and real sounds and smells taking you straight to the pages of her beautiful stories. The Peter Rabbit™ Garden is a small show garden designed to capture the very essence of Beatrix Potter’s world, from the cos lettuces that Benjamin Bunny nibbled on to the gooseberry bush where Peter got caught in a net as he tried to escape Mr. McGregor. Don’t forget to view the beautiful bronze sculpture which symbolises the inspiration Potter’s books has given to generations of readers and depicts three children releasing the figure of Jemima Puddle-duck. Back inside the exhibition follow the adventures of Squirrel Nutkin and Mrs. Tittlemouse and see the drama unfold in The Tale of Fierce Bad Rabbit. Then pop in to Mrs Tiggy-winkle’s kitchen and smell the fresh laundry. A perfect photo opportunity for the little ones in the family! Take a virtual walk of Beatrix Potter’s beloved countryside. Using computer projection, you can take a journey to the places that inspired Miss Potter’s work. 360-degree views and narration brings each scene to life. Also view a short film The Tale of Mrs Heelis and follow the interactive timeline which tells the fascinating story of the author’s life. Enter Mr McGregor’s greenhouse, smell the tomatoes and discover what is lurking under the plant pots and seed trays. Then step in to Peter Rabbit’s beautiful sunlit garden and discover more about the adventures of Peter and his cousin Benjamin. When you emerge from the exhibition, don’t miss a chance to visit the shop and take a little bit of Potter magic home with you. The shop is a treasure trove of gifts inspired by Peter Rabbit and his friends.